The low rumbling heard throughout Vermont earlier this week was not the approach of an earthquake nor was it the roar of a low flying F-35. It was the collective groan of disbelief as most of us woke to two, three, and even four inches of snow. After such a disappointing winter, this recent dump seemed to add insult to injury. But this disappointment was not universal. A few savvy farmers whistled a happy tune, for these winners of the weather lottery know that a late spring snowfall is a boon. It’s poor man’s fertilizer! It’s manna from heaven. Really, it’s nitrogen. To farmers, they are one and the same. Of all essential nutrients for plant growth, Nitrogen is king. The atmosphere is 78% nitrogen, which has to be “fixed” into a usable form before it can be taken up by plants. Many processes—some mysterious —are involved in the natural fixing and transforming of nitrogen. And snow has the added benefit of slow release (and the recent melt was almost painfully snow after this last dump). Think of it as a slow-release fertilizer. Spring snow melt is also an important source of soil moisture, sorely needed after the lackluster snow accumulations of the last winter did not produce much of a snow pack. Snow depth and soil moisture are intricately connected. The deeper the snow, the greater potential for moisture storage in the soil. Garlic loves moist soil, that is not too wet. So, cheer up! 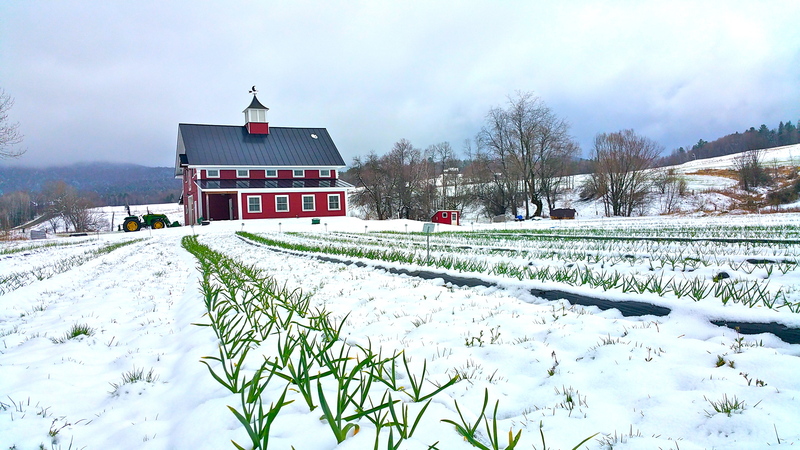 The snow is almost gone and the garlic will be amazing this year! This entry was posted in Garlic Lore. Bookmark the permalink.